Iddings Makers began in the early 1990's when a saddle was given to Mike Iddings by his wife’s Grandfather, Jerome Prokop. Jerome purchased this saddle in 1926 from a drifter near the Pickstown Dam on the Missouri River, close to Spencer, Nebraska. It had been sitting in an old hog building on the family farm for an untold number of years and badly needed repairs and preservation. This saddle, the work it needed and the story it told peaked the interest of Mike, along with his son and co-founder Zach, and ultimately spurred the switch from primarily repair to production - which led to our future in leather craft. At this same time, Mike had been fiddling around with saddle repair for family friends and neighbors. This included a new friendship to Vic Heyden of Heyden Quarter Horses that ignited from trading saddle/tack repair for horseback riding. Little did we realize at the time, that this friendship would cause a spike in our leather craft production in years to come as we eventually outfitted most of the Heyden family with saddles, chaps and other miscellaneous items. A combination of long South Dakota winters and a growing interest in leather craft was all it took to convince Mike to start making brand new products. With a starter kit from Tandy Leather Company, and a fist full of how to books, a basement workshop and lots of spare time Iddings Makers was born. Mike started out small, both small business and small projects, mostly Christmas and birthday gifts for the family. As Mike began to stamp out belts, checkbook covers, wallets, key cases, and pouches; Zach observed and made "projects" of his own. During the winter of 1996 Mike was convinced his skills had advanced enough to try for the granddaddy of all leather projects. Having thoroughly read the three Stohlman Encyclopedia of Saddle Making books he set out on what seemed like an insurmountable task. After logging long hours in their makeshift shop during the winter, Mike managed to finish his saddle. Since that spring Mike’s first saddle has proven again and again the quality and longevity of an Iddings Makers Saddle, and still has 100% of the integrity it left the shop with almost 16 years ago. Within a few years Mike began taking on custom saddle orders, and they started pouring in. 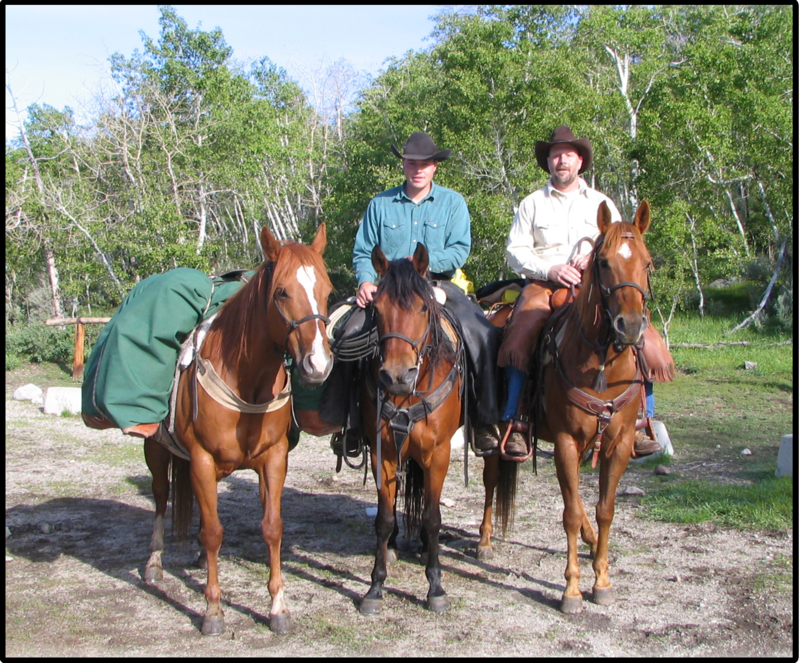 During the spring of 2005 Zach finished his first saddle and Mike finished his sixth. Both continue to work hard in the leather shop, for now still mostly during the winter, but it is progressively becoming more than just a hobby for Zach. While in school at Colorado State University in Fort Collins, Colorado, Zach worked with the Packing and Outfitting class for two and a half years as a teaching assistant. This class and a summer packing in the mountains has helped to develop a line of pack saddles that are now being produced by Iddings Makers. The first pack saddle was built for the Mountain Riders Horse Club of Colorado State University. Additionally for CSU, Zach is proud to be a co-sponsor and saddle maker of the Colorado State Colt Training Competition trophy saddle since 2006. The annual edition of this saddle is presented in April at the Legends of Ranching Performance Horse Sale, and is on display at the CSU Equine Center in Fort Collins, CO for several weeks preceding the sale and competition. In May of 2008, Zach graduated from CSU with a Bachelors of Science Degree in Equine Science. He promptly moved north to the Bear Paw Mountains in north central Montana where he continues to manage the horse program and train horses for Cowan Select Horses LLC. He is able to use his accredited education and past experiences to train and manage horses on the ranch while he continues building custom saddles for customers all over the country. The two professions complement each other very nicely. Mike continues to build a saddle each winter, he also keeps busy with bridles, chaps, breast collars, and a plethora of other small items. Pictures of all our most recent work can be found under the saddles, chaps, and small items pages. Happy Trails, Sincerely Mike and Zach Iddings.